Saturdays: 11:00 a.m. to 3:00 p.m.
Thursdays: 12:00 p.m. to 4:00 p.m.
Narrated Boat Tours - Sundays: 1:00 p.m. to 5:00 p.m.
Dinner Cruises - Wednesdays & some Thursdays: 6:30 p.m. to 8:15 p.m.
Over the past 32 years, a group of volunteers have taken a 164-acre tract of town land and transformed it into a park with the three-fold purpose of the historic preservation of seven miles of the abandoned Erie Canal as it ran through Camillus, educating children as well as adults about the role the Erie Canal has played in local, state, and national history, and serving as a recreational area for the enjoyment of the local population. Since its inception, all the work and operations at the park have been handled by the volunteers, who have cleared the canal and trails, built the bridges, boathouses, and dams, and continue with weekly work parties building trails, bridges, and conducting boats tours. The park has been under development since 1972. It is part of the Town of Camillus Parks system, which provides funding for development materials and equipment. Within the park, every structure that is needed to operate a canal is represented: the remains of the original Erie Canal, the first enlargement, a replica of Sim’s Store, a replica of a lock shanty, a canal feeder, Culvert 59, the Nine Mile Creed Aqueduct, and Gere Lock. Sims' Museum is a replica of the original Sims canal store, constructed by John Sims prior to 1860, which was located on the Erie Canal about two miles east of the present location. The original site was closer to Gere Lock and Belle Isle, able to take advantage of the fact that the boats had to stop there before entering the lock and/or stopping at Belle Isle. The store was stocked with anything the canal fleet needed in the way of medicines, cooking tools, food & water, kerosene & coal, apparel, animal feed & equipment, and hardware. Inside and outside, the store was a gathering place for the general population of Amboy. 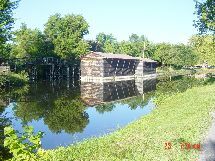 The store provided for all the needs and supplies for the canal boats, including groceries, hardware, feed, and other supplies. The Sims Store Museum is open year round on Saturdays from 11:00 a.m. to 3:00 p.m., with additional seasonal hours on Thursdays from 12:00 p.m. to 4:30 p.m. and Sundays from 1:00 p.m. to 5:00 p.m. during the months of May through October. The Park is available year round for picnicking, hiking, jogging, bicycling, cross-country skiing, snowmobiling, fishing, and non-motorized craft boating and canoeing on the canal. Narrated boat tours are conducted May through October on Sundays from 1:00 p.m. to 5:00 p.m. Fare is $3.00, $1.50 for children under 12, and children under 5 are free (maximum family fare for parents plus children is $10.50). Summer dinner cruises are conducted June through August on Wednesdays from 6:30 p.m. to 8:15 p.m. Group luncheons are also available. Menus include specialty prime rib dinners and alternative selections. Cost is $24.00 per person. Enjoy a dinner cruise along the Erie Canal! Cruises are held on Wednesday evenings throughout July and August and depart at 6:00 p.m. from Sims Store Museum on DeVoe Road. Meals are catered by a local favorite restaurant, Ernie's of Lakeland, and choices include prime rib, stuffed breast of chicken or vegetable primavera with red sauce. Arrangements for luncheon cruises upon request. For more information visit the Erie Canal Park Website. Towpath Day along the Canal is an annual event featuring a fun filled day of old fashioned crafts, great music, children’s activities, and canal boat rides with food and drinks available.